Having read The Undercover Economist, I vowed to take some time off from reading the economics equivalent of kitchen psychology. Yet, here I am again. I tried to read some fiction for a change, but for some reason, I haven't been that interested in the usual plot driven novel lately. For the life of me, I can't tell you why. I always promise myself that the next book I pick up will be a classic piece of fiction - I did really enjoy that Steinbeck - but something has kept me back. 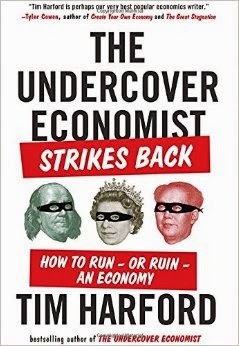 So, once again, The Undercover Economist Strikes Back is a fine piece of economics education packed in a neat paperback, buy it at the airport, format. I read it on my Kindle, and I have to say that I won't miss the paper version in any way. I might be interested in scrolling through the reference section later, but that will have to wait. Tim Harford is great at making simple compelling points about complex things and exploring different sides of a difficult topic. He does it here by comparing classical economics and Keynesian economics. And who wins? Nobody in particular because from what I can tell, Harford plays out both sides merits equally. The narrative is constructed as a dialog, which I though was a little lazy at first. But despite the awkward structure, the dialog between Harford and an imaginary dictator plays out with wit and has some of the best revelations of the story. From a distance, you might not even realize that its a book about macroeconomics. As a friend of mine once said, "It's got graphs that intersect, it must be macroeconomics". You won't find any of that here. The Undercover Economist Strikes Back is text only, even the Phillips curve doesn't get its own little x-and-y plot. Not that I miss any of that. The whole point here is that macroeconomics is difficult. So difficult in fact, that we still have no good ways of thinking about it. So if someone tells you with absolute certainty that monetary stimulus ends recessions, by reading this book you'll know that it's not so simple.